711. 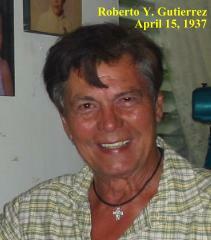 Roberto GUTIERREZ was born on Apr 15 1937. He is also known as Bob. In Philippine movies, he is otherwise known as Bob Soler. 1442 iii. Catherine GUTIERREZ is also known as Cathy. +1443 iv. Yvonne Marie GUTIERREZ. +1444 v. Robert Gregory GUTIERREZ. 1445 i. Marco GUTIERREZ was born on Oct 13 1990.